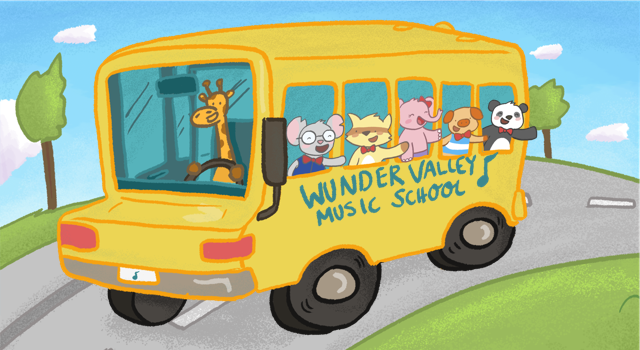 Back To School With WunderKeys; How Piano Lessons Can Help! It’s that time of year again… backpacks and lunch making and early mornings. If you’re sending your child to Kindergarten for the first time, and if he’s been involved with WunderKeys lessons before starting school, you can be confident in knowing that his piano lessons have prepared him for many of skills he’ll be needing as he enters Kindergarten. He’s learned to be independent and to be comfortable spending one-on-one time with an adult other than a family member. He’s learned to listen to verbal and visual directions and respond appropriately to indicate his understanding. He’s improved his fine motor control which aids in beginning printing skills. He’s learned to listen to and recognize rhythm; aiding in his ability to absorb language and patterns in reading and writing. He’s learned one-to-one correspondence; a skill that is needed for almost every math concept. He’s learned to count and to recognize numbers. He’s gained confidence in front of others through performance opportunities. He’s learned to sort objects into large and small and greater than/less than. He’s learned to decipher patterns and to predict “what should come next”. He’s learned to focus his attention on one task at a time. He’s learned to work through challenges until reaching success. He’s learned that math is found in every-day life and is enjoyable and approachable. He’s learned to appreciate music, to find joy in making beautiful sounds and the happiness that comes from sharing his music with others. Starting school with WunderKeys experience means you can send your child to school confident in having given him a head-start! Click here to check out the WunderKeys Method Books.